Cambodia is a fascinating country with a unique and troubled history. The dark years of the Khmer Rouge ended in 1979. Today Cambodia is a peaceful and exciting country with an incredible cultural heritage. Starting in the capital city, Phnom Penh, you’ll see the major historical sites and you’ll also get the chance to visit Siem Reap, home to the glorious Angkor Wat Temple. You will be greeted at the airport by your representative and accompanied to the hotel. Despite its recent turbulent history, this is one of the most stunning cities in the Orient. It’s kept its old world charm yet it’s also a bustling, modern metropolis. The streets are lined with wild trees, and a countless number of tuk-tuks zoom around. You’ll see a unique fusion of Western culture merging with Asian tradition. You’ll have some free time to relax and freshen up after your flight. In the evening enjoy a welcome dinner at the stunning Malis Restaurant, one the best Khmer restaurants in the capital. After breakfast you’ll visit Tuol Sleng Genocide Museum, and learn about the devastating recent history of Cambodia. You’ll then visit the Killing Fields of Choeung Ek. This will take you to the site of some of the worst mass killings in history. The Khmer Rouge era led to millions of deaths. as the communist regime attempted to force people back to the dark ages. It’s astonishing to see how Cambodia has recovered from this period of trauma, considering it only ended in 1979. You will then head to Stung Meanchey on the outskirts of the capital. This district is home to Pour un Sourire d’Enfant, an organisation created to provide education and job training to children from poor backgrounds. It aims to educate them and give them a chance of finding their independence. You will have lunch at the centre’s training restaurant, Le Lotus Blanc, where you can support the education of the kids by being their guest. After lunch you’ll head back to the hotel where you’ll be greeted by your driver. You’ll then be taken on a tour of the most remarkable sights of Phnom Penh in a Cyclo – a vintage Khmer means of transportation. First, head to the Royal Palace; it dates back to 1866 and houses the Silver Pagoda, named after 5000 heavy silver tiles that cover its floors. Its original name is Wat Prakeo, meaning Temple of the Emerald Buddha. In this temple you’ll see a stunning collection of Buddhas in gold, silver, crystal, and bronze. Visit the Wat Phnom temple, which is the founding place of the city! You’ll then continue to the Foreign Correspondents’ Club, located on the river. Round off the evening with some sunset cocktails. After breakfast, embark on a private riverboat tour along the Tonle Sap River. It’s rarely visited by other tourists as it’s only accessible by boat. On this tour you’ll pass many floating villages and fishing stations. The riverside is dotted with pagodas, mosques, Chinese temples and local villages. At the village of Koh Chen, the main trade is silver and copper. You’ll see how they create ornamental items used in traditional weddings. Lunch will be served on board the boat. After lunch, you’ll return to Phnom Penh. Start the day with an early breakfast and then you’ll be transferred to Siem Reap (this usually takes around 7 hours). Siem Reap is famous for its majestic temples of Angkor. Upon arrival, check into your hotel and freshen up. It’ll then be time to set out on your adventure. You’ll be led to the Angkor National Museum. Here you’ll see artefacts from the Golden Era of the Khmer Empire by the use of multimedia technology. This brilliant period of history will be brought to life before your eyes. Catch your first view of Angkor Wat when you visit the early temples of the Rolous Group. This is the site of the ancient centre of Khmer civilisation known as Hariharalaya. Built by the Angkorian Kings in the 8th and 9th centuries and consisting of three main temples called: Bakong, Lolei and Preah Ko. These temples are quite a contrast to the surrounding countryside which is comprised of paddy fields and sugar palm trees. At Rolous pagoda, you’ll see the Buddhist monks; they’ll celebrate a private blessing ceremony for you. This will be a memorable experience. Take a break around midday back at the hotel and have some lunch. After lunch, you will be taken to Angkor Thom, which was the last city of the Khmer Empire during the reign of Jayavarman VII. The city is surrounded by a huge square wall. You’ll enter the city through the south gate with its carvings of elephants and four giant faces. The side of the entrance path is guarded with a row of 54 gods and demons. Once you have explored Angkor Thom, you’ll head to Bayon Temple, which is located in the centre of the city. 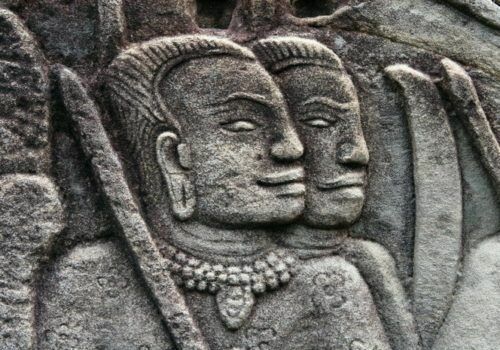 It’s known for its 54 towers with mysterious faces carved into them, representing the 54 provinces of the great Khmer Empire. After breakfast you’ll make your way to the temples in a tuk-tuk. Your first stop will be at Ta Prohm which remains largely unchanged. You will see the overgrown jungle foliage surrounding the stone structure. Many parts of the temple have collapsed. Parts of the Tomb Raider movie were filmed here, so it may look familiar. Your visit will also include Banteay Kdei, a Buddhist monastery from the late 12th Century, and Srah Srang, also known as the “pool of ablutions”. Return to the hotel for a break during the midday heat and grab some lunch. This afternoon is the moment you’ve been waiting for. 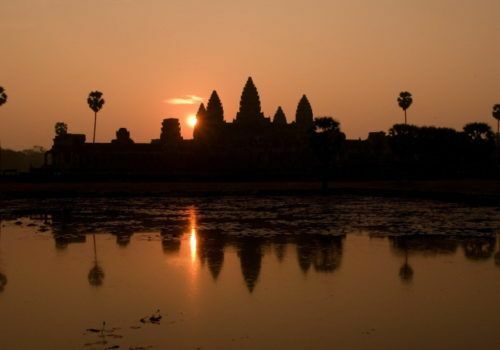 You’ll head to the famous Angkor Wat. Inside the temple, the walls are decorated with beautiful carvings depicting Hindu mythology and the wars Suryavarman II fought during his reign. Its majestic structure is truly breathtaking. As this is your last evening in Cambodia, there will be a farewell dinner accompanied by traditional Apsara dance. Today it’s time to say farewell to Cambodia. Depending on when your flights are scheduled, a driver will pick you up from the hotel and drop you off at the airport.